In this third instalment of Whittle’s cheeky series, Georgia is perplexed with the problem of convincing the haughty new girl at her school, Nina that dragons exist. She has the perfect proof, of course, one gigantic, exuberant real-life dragon. However, as Trouble is still banned from the schoolyard, getting Nina to believe in her and her dragon proves harder than imaginable. 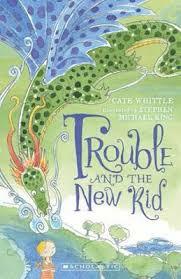 Whittle’s artful way with humour and whimsy go hand in hand with King’s magical line drawings. There are vibrant characters and irascible reptiles to love in this series ideally suited to early primary aged readers who appreciate being on the wrong side of naughty. More than a pastime, shark calling is a way of life, a cultural necessity, and rite of passage for those from PNG and the surrounding islands, a custom etched more deeply within their ancestral history than a Pacific Ocean trench. At least this is what recently bereaved twin, Izzy discovers as she heads back to her birthplace. Shark Calling is an interesting practice and one this erstwhile fearer of sharks found intriguing. It is also a skill that is fast becoming a thing of the past. Wolfer writes a compelling tale, gripping enough to sustain attention as 12-year-old Izzy learns to dive and endure one of the most strenuous rituals of her clan. She is driven to succeed to secure the survival of her mother’s people and their lands but also by a desperate need to reunite with her beloved twin brother. Wolfer’s straightforward narrative both enlightens and mystifies, and is convincing enough to allow young readers to be drawn along the frightening lava vents and deep-water caves with Izzy as she attempts her bizarre and dangerous quest. 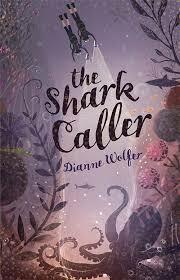 Izzy is haunted by wisps of failure after her return and whilst the plight of the sharks and those who sub-exist with them is never fully resolved, there is a strong sense of resoluteness in the end. The quotes from various notable historic figures that head each new chapter are particularly welcome and complement both aspects of fantasy and reality that follow in that chapter. A unique and engaging novel for upper primary aged readers. Factual and fanciful, this time-slip novel really does have the essence of Playing Beatie Bow about it. Kane’s absorbing narrative juxtaposes Victorian staunch with 2000 and something flippancy as modern day Madeleine is unexpectedly thrown into the past and, as it turns out, her own colourful family history. The vein of feminism and equal rights courses strongly through this story supported by some of my favourites characters such as Gert and stoic Aunt Hen Pen. Each of the young characters is beautifully carved out of outdated 1900’s sameness creating some interesting and entertaining opportunities to unite historical milestones with later day actualities. It’s a journey of self-discovery for tween Maddy Moo that teenage girls in particular should find as spellbinding as the mimicking cheek of the Lyrebird. 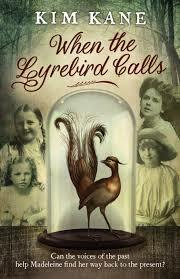 When the Lyrebird Calls is a solid, substantial, and engrossing read for 10 – 14-year-olds that has all the winning elements of Belinda Murrell’s fascinating historical time-slip adventures.